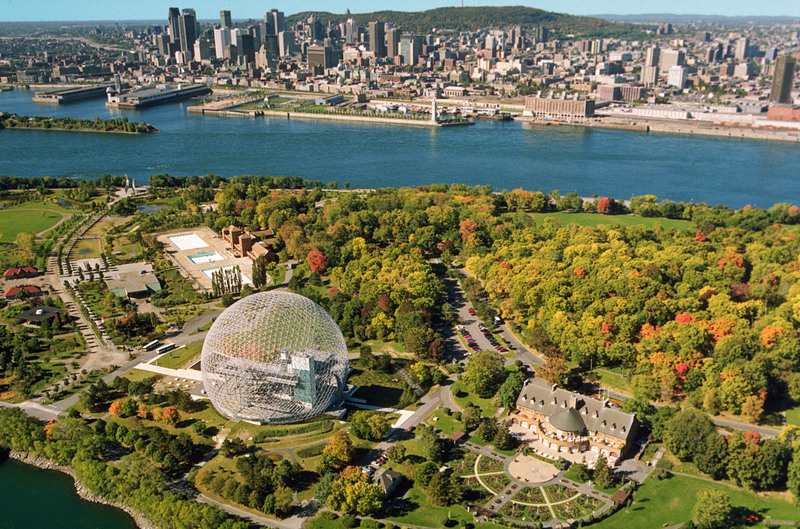 We’re experiencing an Indian summer here in Montreal. Since it was such a beautiful day, I decided to spent it out of doors. And since I’m not watching the series ending of “Breaking Bad” tonight, I’m going to write about it! I feel like I owe Montreal a bit of an apology after my last post. So, by way of saying I’m sorry, here is an ode to this gorgeous city on a beautiful, warm, sunny Sunday at the end of September. Montrealers LOVE their brunch. It’s as if as the churches emptied, the brunch spots filled up. It’s pretty much a religious institution on Sunday mornings. Hangover cure? Perhaps. In any case, delicious. This morning, my dear friend Marjorie invited me to join her at the pub Le Pourvoyeur, right next to Jean Talon market. Their smoked trout bagel was scrumptious and came with a hearty side-serving of home-cut French fries and a salad that was, thankfully, not over dressed. Perfect. Brunch was followed by a stroll through the market. It is probably one of my favorite places in Montreal to people watch. 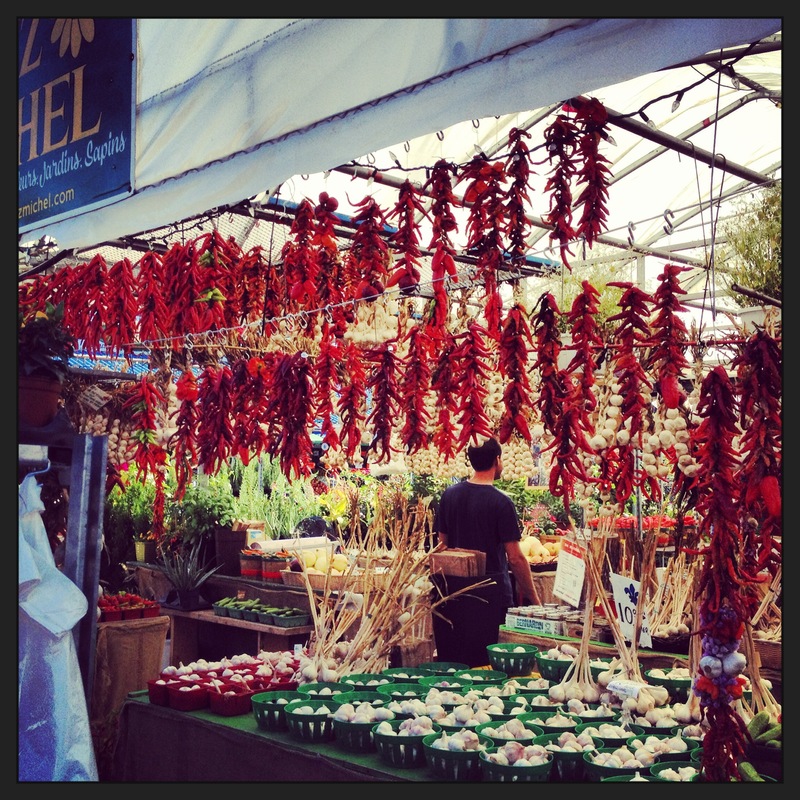 Chillies & garlic hanging out at the Marché. 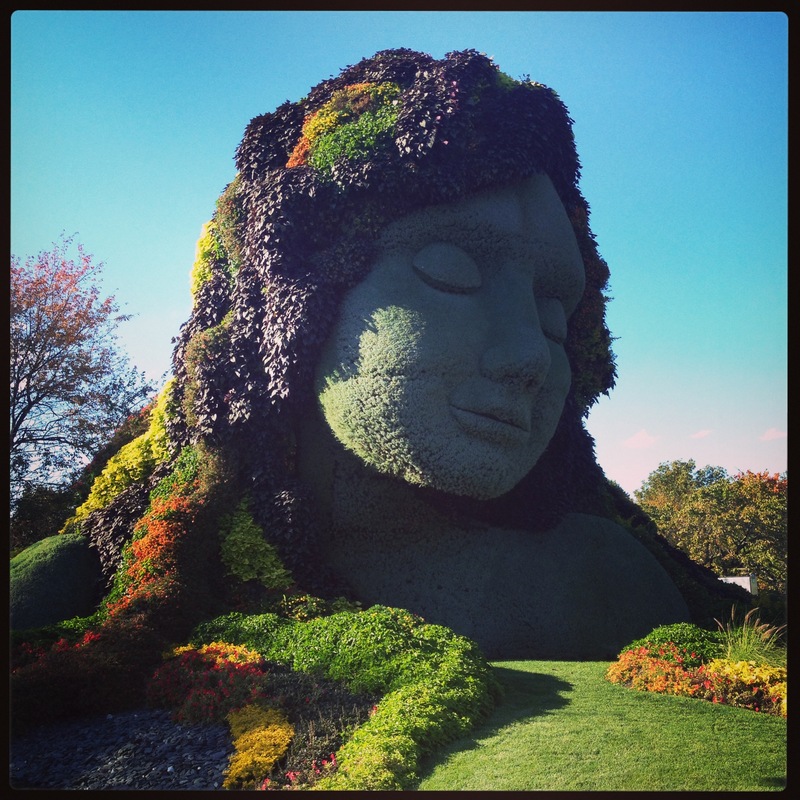 After our brunch, my lovely friend Taija invited us to join her at the Montreal Botanical Gardens. Last year, Chico and I went to the butterfly show at the Montreal botanical gardens, but we never saw the actual gardens. 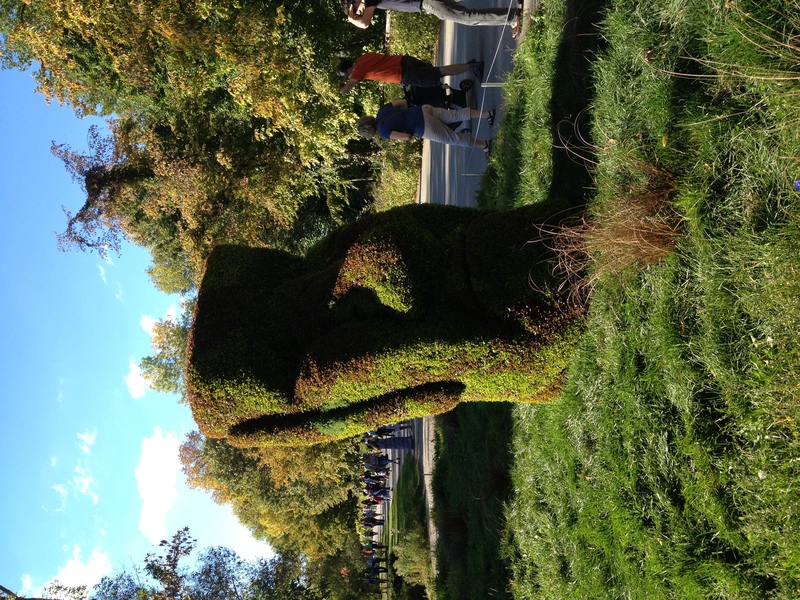 So we went along with Taija to the international Mosaïcultures show. This weekend was the last weekend of the show, so in case you missed it, here are some of my favorite highlights. Don’t be fooled by the lack of people in these photos. It’s only by some miracle that I managed to get any shots with all the crowds jostling by! This was an entire layout with the birds and the lady hugging one to her. I loved this guy! 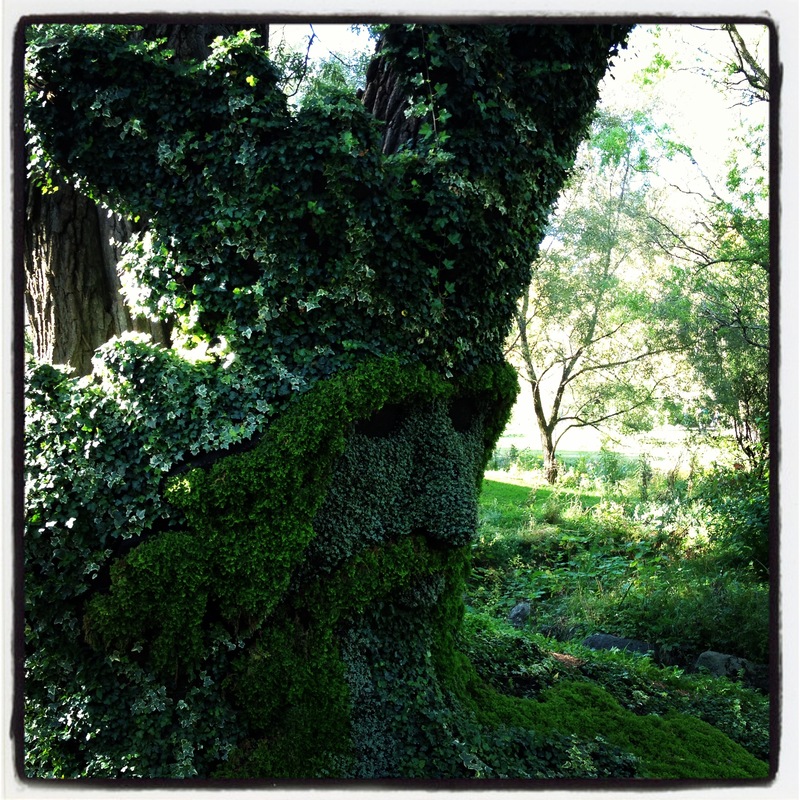 He looks like an Ent from The Lord of the Rings! 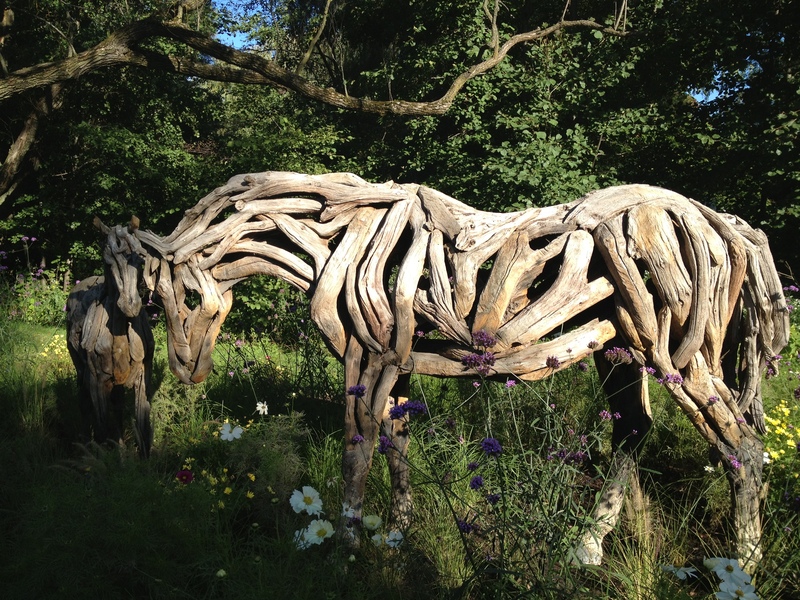 This whole section of the gardens was called the spirit of the woods, and this guy was pretty much the king. But then, we came upon Gaia. The most splendid of them all. It was so crowded and the sun was behind her, so it was hard to get a good shot. But Gaia, or Mother Earth, was composed of this head and two hand seemingly coming up from the ground. A giant eagle ate out of one hand and deer were running out of the other. A stream ran past her and giant horses were frozen in a gallop along it, while giant bison grazed across the path from her. It really was something. 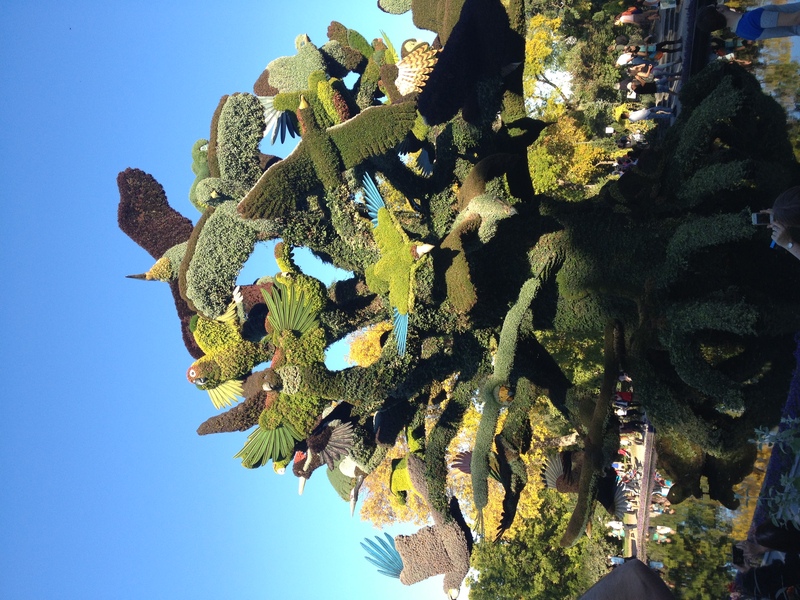 The Tree of Birds was also something to be seen. 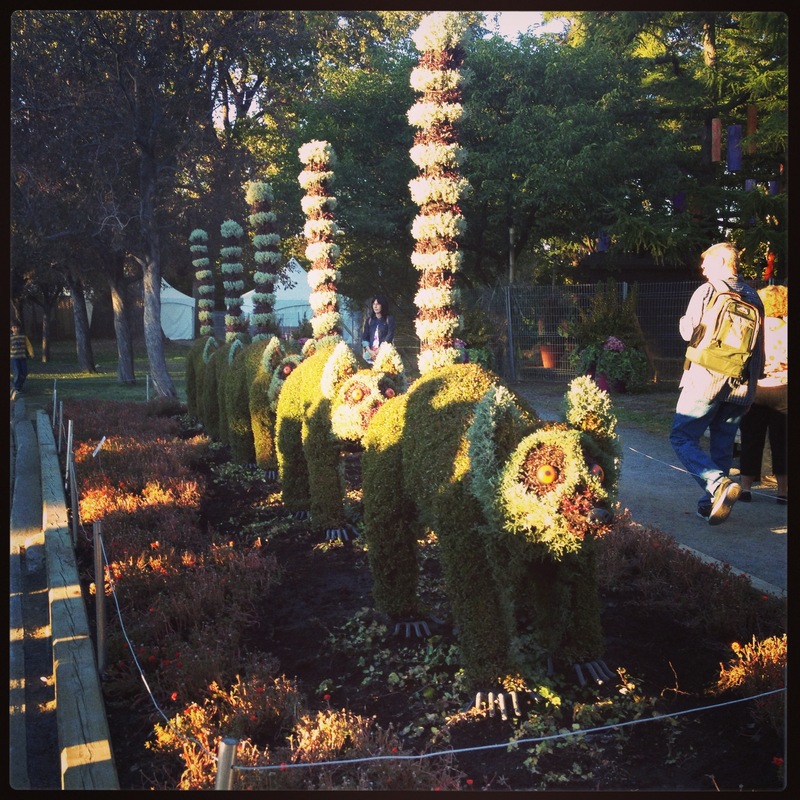 Lemurs in a line looking livid. The giant petrified-looking lemurs were pretty hilarious. 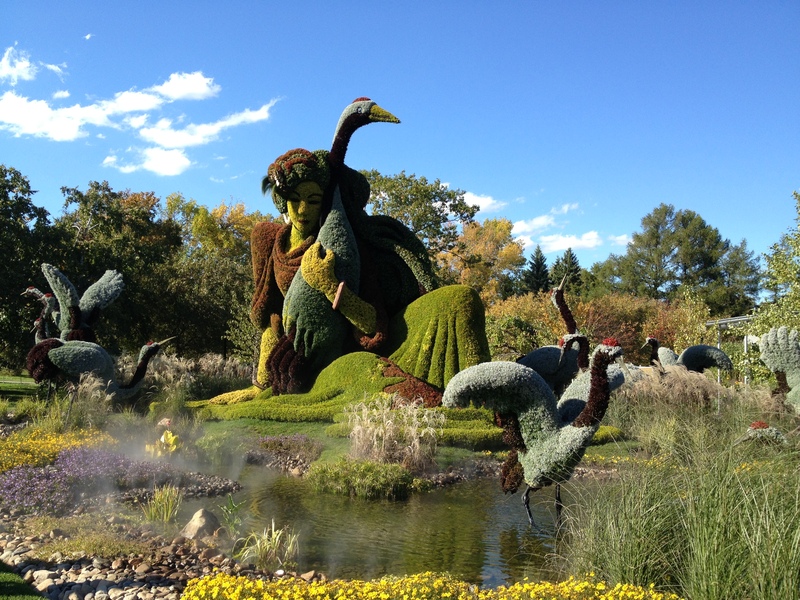 Sadly, like I said this was the last weekend to get to the Mosaïcultures show. I thoroughly enjoyed it. It certainly beats what I had planned to do: stay at home and do laundry. The day ended off with a relaxing evening at home and some delicious spiced carrot and red lentil soup (I recommend you switch coconut milk for regular milk–it makes it even richer and tastier). With the Indian summer weather and activities like these going on, it’s no wonder that the city has felt alive all weekend. On Saturday night, well after midnight, Montreal was still wide awake with people coming and going here and there. I could hear laughter and singing under my window. Drifting off to sleep with the sounds of merry-makers and a breeze ruffling the curtains reminded me of why, despite the bad and ugly parts of life in Montreal, I really do like it here. It’s finally here, friends! 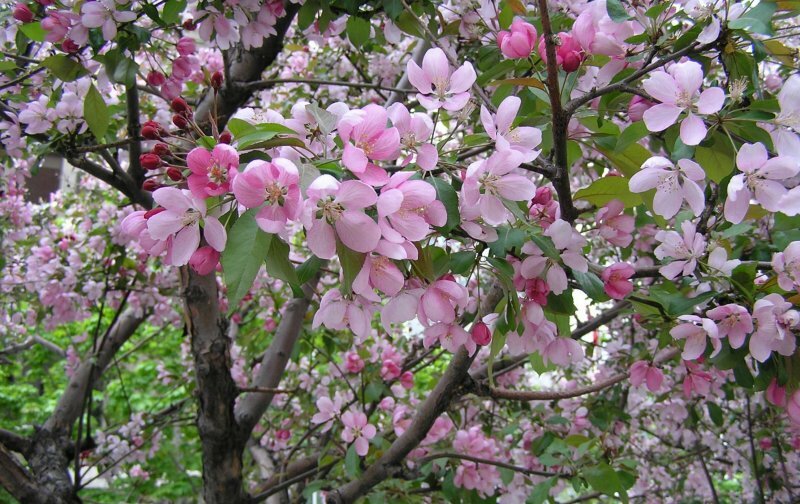 Spring has sprung in Montreal! This week, temperatures are getting up to 14° or 15°C (57° to 60°F) and the sun is out and shining its face off. It may look like there wasn’t much snow, but that’s just because the GALE FORCE WINDS were blowing it away. 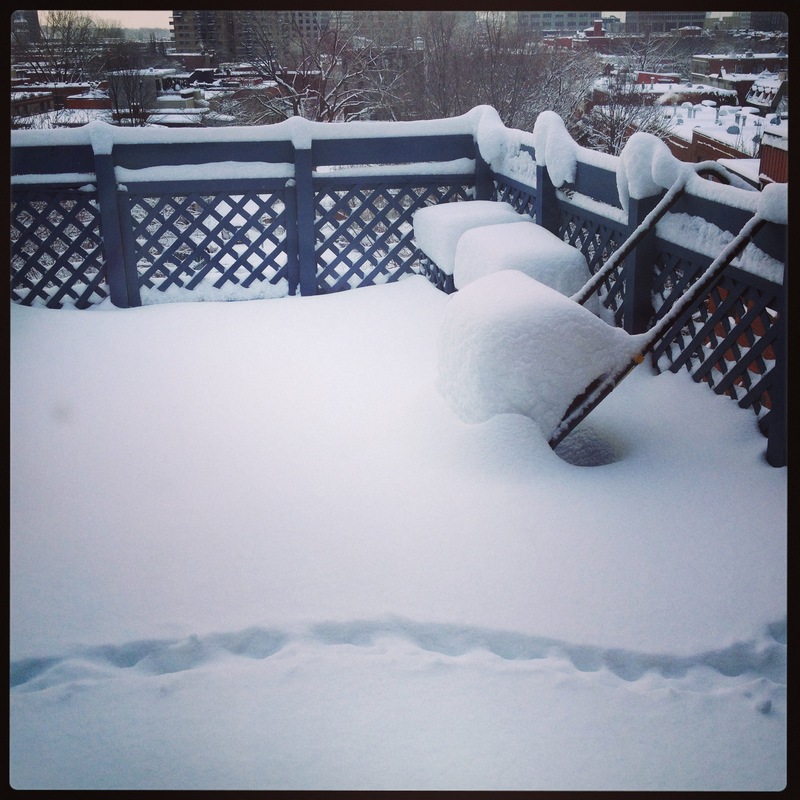 In Montreal, they call this a “dusting”. What a wonderful time of year spring is. It’s a time to take a fresh look at things, to see things from a new perspective. All winter we get bogged down with the dark and the cold, and it’s amazing just how much clarity a little more sunlight can bring to our lives. 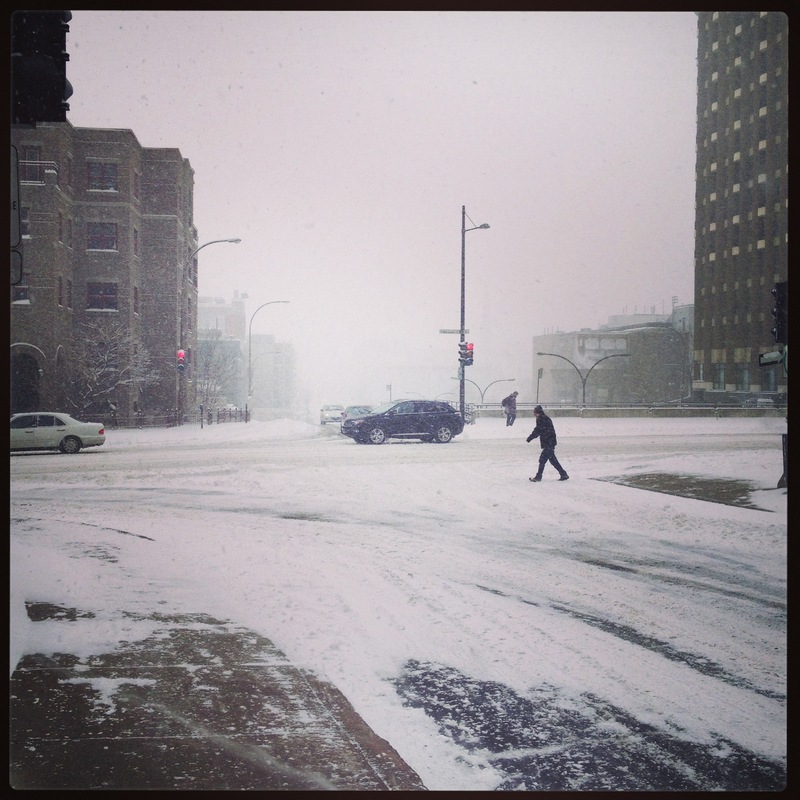 This winter, I got bogged down thinking too much about the future. Perhaps it was because the present was so unbelievably dark, cold, windy and dreary (see above photos), but it’s also because I have a tendency to forget to live for the moment. Chico and I are both planners. We like to organize, schedule, plan and prepare. Improvising is not a huge forté of ours, though we are not incapable of it (“What should we have for dinner?” “I dunno, let’s improvise!”). Right now, our future plans are not yet settled, and that has caused me no small amount of anxiety. Planning for the future is important, and being prepared is, after all, a great motto to follow. But sometimes, spending too much time thinking ahead can cause us to forget to enjoy now. And now is so pretty! Look! This may be more of a fall photo, but you get the idea. Walking home today past the musical swings at Place des Arts in downtown Montreal, I had an “aha” moment. Looking around me, everyone was so happy to be outside in the first warmth of spring, and the sunshine that I realized what a shame it is to waste even a moment of the very fleeting present in worrying about the future. Of course, we will take steps to firm our plans, and we will move together towards our goals. But as of this moment, I am determined to simply enjoy NOW. I will live in the present. Because the present is all that we can be 100 per cent sure of. And as Chico will be home presently, I’m off to make our supper.